Classic Car- Drive it or Store it? It is a continuing dilemma for the classic car market. You run across a collectible car with ridiculously low mileage. The car owner may even be asking for a premium for such a low mileage beauty. The car probably comes with every artifact that came from the factory. But here is the dilemma. Do you buy the car and continue to keep it in storage and keep the odometer from rolling up? Or do you say the car was meant to be driven and keep the pedal to the metal, as the numbers on the odometer tick up? There is an adage in collector car circles, that a car can only be original once. Similarly the car can only have that low odometer reading once too. Some fans will argue that to appreciate the car it needs to be driven and enjoyed. But they acknowledge that by doing so, the value will tank. Others will argue it can be enjoyed while staying intact in the garage. What to do? 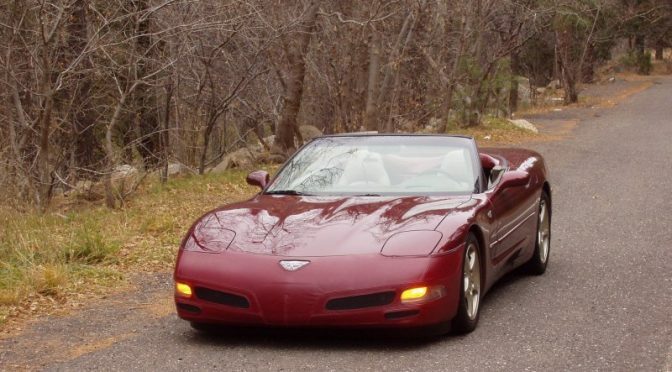 This 2003 Corvette is a perfect example of this conundrum. The first owner appears to have taken exceptional care of this stored classic. He says he started the car every couple of months to circulate the fluids and moved the car every 4-6 months, to avoid flat spotting the tires. He has all the marketing materials and even kept the interior lined in the factory plastic protective wrap. His “Buy It Now” price of $44,900 certainly is a premium to other models that sell with loads more miles showing. The 2003 Corvette marked the 50th anniversary of the iconic nameplate and was highly sought after. There is even a registry just for these cars. List price was probably over $56,000 and some dealers were aggressive in marking up these 50th Anniversary Editions. 11,632 of these Anniversary Red metallic C-5’s were made and occasionally you can find one with less than 20,000 miles; but this convertible has only 57 original miles! So do you buy it and start driving it? After all the posting does say – “Drive it home if you want. It’s ready to go.” Or maintain it as is, and keep the low miles? Let us know what you would do if you were the new owner.